A long time ago, we ordered a set of nesting chickens from Lakeshore Learning (now discontinued). They were meant to go in our children's department's toy area. We just felt like they came apart too easily and weren't that fun of a toy. So they have been sitting my office for about a year decorating the top of my filing cabinet. Really, that was a noble life for a set of nesting chickens. It could have been worse. BUT I wanted to find some library-related use for them. So, lo and behold, this week I was planning a ducks and chickens storytime when I happened to walk by them again, like I do multiple times a day since this filing cabinet is between my desk and my office door. And an idea struck me. What if I used the words from a previously posted rhyme about Nesting Cats and made it Nesting Chickens. And thus it was so. 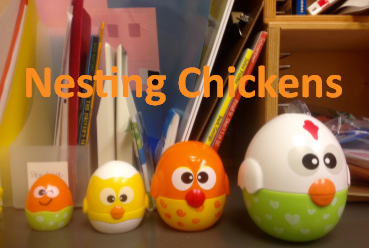 I give you "Nesting Chickens:"
This week's Flannel Friday roundup is being hosted by my good friend Cate at Storytiming. Well, here's my next flannel project! I love this--thanks for posting!